Worldbuilding: We visit Washington DC this time around, as well as return to New Covington, the Fringe and some of the haunts from book #1. Fabulous dystopian world with paranormal (vampire) elements. Characters: Allison evolved, I thought she grew up as a vampire as well as a young woman. She’s even braver then she was in book #1, takes chances and dares to try (esp. emotionally speaking) despite being afraid. I loved how loyal she proved to be, how vulnerable despite being kickass (katana action rules!). I still didn’t feel the romance between her and Zeke, because something about the two of them just didn’t click for me to begin with. Don’t get me wrong, he’s sweet (Maybe too sweet? That might be my personal ity bity problem with him, I’m not into sweet…), but he won’t be making my fav characters of the book top. Jackal does, he’s more my type of character. And I loved him, by the way. He kept me guessing and still does even now, after having read the book. And let’s all give Kanin a round of applause, the guy is cool. Fav Character of the book for me: Jackal. Plot: Active and very engaging, though I can’t say that surprised me all that much. Julie Kagawa has awesome stories to tell and knows how to make you fall in love with them. Writing: First person narrative from Allie’s POV with one minor exception, last couple of pages there. Awesome, awesome, awesome writing. Did I mention how awesome it is? Freaking awesome. Curb Appeal: Julie Kagawa – need I say more? 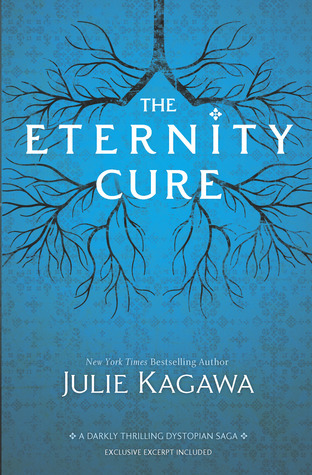 Fab cover and intriguing title, but again, Julie Kagawa. Need I say more? Instant buy material.